Las Abejas Civil Society association president Sebastián Pérez Vásquez welcomes the pope’s message speaking up for people and the planet. Photo by Sandra Cuffe. During the pope’s recent five-day visit to Mexico, indigenous and community groups from throughout Latin America gathered to discuss land rights issues. As an organization rooted in religion and faith, Pope Francis’ support for peace, marginalized people, and the environment strongly resonates with Las Abejas members, most of whom are Catholic. Pope Francis’ second encyclical, Laudato Si, continues to resonate with many people and organizations in Latin America. More than 100 people from 15 Latin American countries attended the event, held the weekend immediately preceding the Pope’s visit to the southern Mexican state. Green wooden crosses line the edges of the open air auditorium overlooking the highlands of Chiapas, in southern Mexico. Below the cement floor lies the tomb where 45 Maya Tzotzil children, women and men are buried after having been massacred in Acteal by a paramilitary group in 1997. Killed while they were praying in the local chapel, the Acteal massacre victims belonged to Las Abejas Civil Society, a grassroots faith-based pacifist organization formed five years earlier. “We’re still here, taking care of the survivors and of the blood of the martyrs,” Las Abejas president Sebastián Pérez Vásquez told Mongabay and a handful of other publications during a visit to Acteal last week, a few days before Pope Francis’ February 15 visit to Chiapas. The December 22, 1997 massacre took place in the context of the Mexican government’s counterinsurgency campaign in Chiapas following the Zapatista uprising of 1994, when a guerrilla army of thousands of Mayans descended on cities and towns in the state, demanding land, autonomy, and democracy. Las Abejas supports the Zapatistas’ vision and demands, but does not support armed struggle. However, that did not stop the pacifist group from becoming a target in the ongoing low-intensity conflict. Justice for the massacre of unarmed villagers continues to be a central focus for Las Abejas, but the group also defends land rights and speaks out against government reforms, natural resource exploitation, and other threats to indigenous territories, forests, and organizations. Indigenous communities in Chiapas face the imposition of hydro-electric dams, mining, infrastructure, and other projects in their lands, and community leaders organizing against such projects in the state have been threatened, jailed, and killed. “The pope brings an important message,” said Pérez Vásquez, adding that the pontiff defends Mother Earth. During the pope’s recent five-day visit to Mexico, Las Abejas participated in a gathering with indigenous and community groups from throughout Latin America to discuss that message. “It’s not just here that we’re struggling to defend territory, but in other countries too,” said Pérez Vásquez. Indigenous people and organizations discussed Pope Francis’ second encyclical during the pontiff’s February 2016 visit to Mexico. Photo by Sandra Cuffe. Pope Francis’ second encyclical, Laudato Si, continues to resonate with many people and organizations in Latin America, where the majority of the population is Catholic. The 184-page document published by the Vatican in June 2015 deals with climate change, environmental destruction for economic gain, development, inequality, and the gospel of creation, among other themes. Addressed not to bishops but to all people, the crux of Pope Francis’ message is reflected in the encyclical’s subtitle, On Care For Our Common Home. “I urgently appeal, then, for a new dialogue about how we are shaping the future of our planet. We need a conversation which includes everyone, since the environmental challenge we are undergoing, and its human roots, concerns and affects us all,” states the Laudato Si document. The encyclical also directly addresses indigenous people and the large-scale extraction and infrastructure projects affecting their lands. For indigenous people, land is not a commodity, paragraph 143 explains, but a sacred space that is key to identity. “When they remain on their land, they themselves care for it best. Nevertheless, in various parts of the world, pressure is being put on them to abandon their homelands to make room for agricultural or mining projects which are undertaken without regard for the degradation of nature and culture,” the encyclical states. 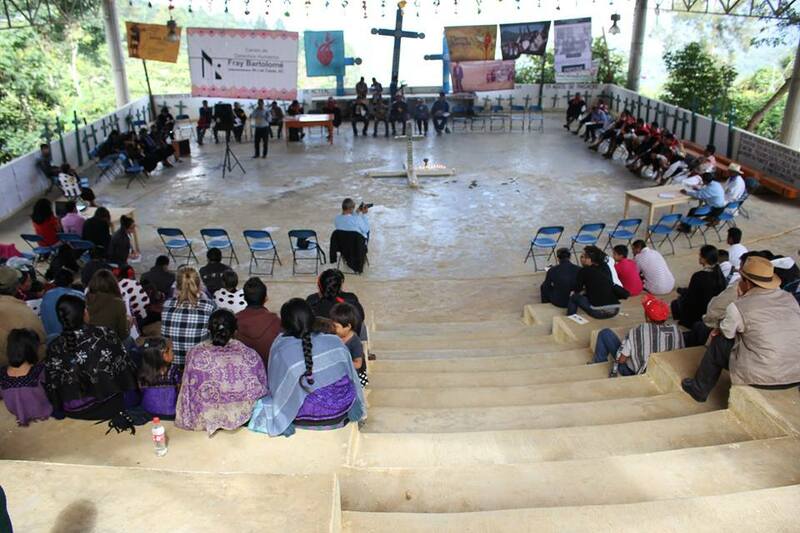 Indigenous nations and organizations gathered on February 13 and 14 in Chiapas to discuss the encyclical together with theologians and with campesino, human rights, and environmental groups. Along with the encyclical, participants presented and discussed struggles in and threats to their own lands, forests, water, and territories. Cándido Mezúa traveled to the gathering from Panama, where he is an elected leader in indigenous Emberá territories located near the border with Colombia. He also has a leadership role in the Mesoamerican Alliance of People and Forests (AMPB), which coordinated the event together with the Fray Bartolomé de las Casas Human Rights Centre (FRAYBA), the Coordinating Body of Indigenous Peoples of the Amazon Basin (COICA), and the Mexican Network of Peasant Forestry Organizations (MOCAF). “There’s a significant change in the church regarding the situation of the planet,” Mezúa told Mongabay. “We saw that it was a good moment to engage in deeper reflection,” he said, referring to the pope’s visit to Mexico. Indigenous Emberá leader Cándido Mezúa traveled from Panama to attend a Latin American gathering during Pope Francis’ visit to Mexico. Photo by Sandra Cuffe. The Emberá continue their decades-long struggle for the legal recognition of collective land rights. At the same time, they are dealing with encroachment into their lands, the long-term impacts of dam construction, and the threat posed to their forests from oil companies and other interests. The issues the Emberá face are the same as those in many communities and indigenous territories up and down Latin America, said Mezúa. “All of this is connected. Countries in the region are managed by macro-regional policies,” he said. Mezúa sees the Laudato Si document as an important tool. Whether or not people are Catholic, the message contained in the encyclical coincides with the world view of many indigenous peoples and their defence of territorial rights, he said. “For us, the sustainability of Mother Earth is a spiritual issue,” said Mezúa. The Emberá leader and other participants in the Chiapas event hope the pope’s encyclical can help influence policy in the region. Words are not enough, they concluded, calling on governments and church authorities to follow the pope’s lead and take action for the future of the planet. Article published by Ruxandra Guidi on February 17, 2016. This is the scene of the largest and most paradigmatic collective wound in the process of liberation and resistance of the indigenous peoples of Chiapas: the senseless massacre of more than 45 peaceful people (Pérez Vázquez insists on this) perpetrated on December 22, 1997 by a group of paramilitaries encouraged by the federal government. This was also an attack on believing Catholics and, at that time, on the Church that Bishop Samuel Ruiz García represented. It was also about the irregular war the State unleashed against the Zapatista movement, which was crude and brutal in Chenalhó during all of 1997. The unarmed allies of Zapatismo were also targets of this war, which was the case with Las Abejas. Although there were investigations and eventually more than 70 paramilitaries were condemned to prison for the acts, “the government never disarmed them, they were their dealers,” the president of the organization says. Now most of the killers are free, and walk around here. Always in crisis. Always in a loud voice. Always in resistance, the Las Abejas organization has resisted for almost two decades the pressures, promises and betrayals of the state and federal governments, as well as those of the courts of justice. It is an adherent to the Sixth Declaration of the Lacandón Jungle and it belongs, since its founding in 1992, to Pueblo Creyente (Believing People), the most numerous and representative popular Catholic congregation of Chiapas, with a presence in all the indigenous regions of the San Cristóbal de Las Casas Diocese. Throughout the night and this morning, the organizations and communities that maintained a collective occupation in the atrium of the San Cristóbal de Las Casas Cathedral withdrew, including the conglomerate of dissident groups united in the Popular Assembly of Los Altos of Chiapas. Thus, the OCEZ of Venustiano Carranza, the residents of Chanal, the Proletarian and Popular Communist Coordinator, and the families displaced from Shulvó (aka Xul Vó), Zinacantán,  set free the space also called the Peace Plaza. With that the rumours dissipate, widely spread in San Cristóbal yesterday, that the Pope “would suspend” his visit to the country’s most important indigenous cathedral. Shulvó or Xul Vó is a community in the official municipio (county) of Zinacantán or, alternatively, the autonomous Zapatista municipio of Vicente Guerrero, in the Highlands of Chiapas. Last December 9, paramilitaries violently expelled 47 people from that community. Those expelled are adherents to the EZLN’s Sixth Declaration of the Lacandón Jungle. The killing began when masked paramilitaries burst into a Catholic prayer meeting and opened fire. Those who escaped the initial attack were chased for hours through the canyons and cloud forests which surround this Tzotzil Indian community of corn and coffee farmers in southern Mexico. Forty-five people died in the assault on a Catholic activist group known as Las Abejas, or the Bees; 21 were women, 15 were children. The perpetrators were linked to the then (and now) governing Institutional Revolutionary party. The 1997 Acteal massacre was one of the worst mass killings of Mexico’s recent history, and it remains a potent reminder of indigenous struggle in Chiapas, a state still suffering from widespread poverty, discrimination and political corruption. “Eighteen years have passed … and we continue denouncing grievances committed against us by party officials, who are manipulated by a government that keeps causing us pain and suffering,” said Las Abejas leader Sebastián Pérez Vázquez. Indigenous Mexico’s fight for recognition and respect was symbolised by the Zapatista uprising which burst into the open on 1 January 1994, the day the country entered the North American Free Trade Agreement (Nafta) – an arrangement the government insisted would vault Mexico into the first world. Later this month, Pope Francis – who has put the poor and excluded at the centre of his papacy – will come to Chiapas as part of his six-day visit to Mexico. He will celebrate mass in several Mayan languages and address the injustices facing indigenous people, who in recent years have departed the Catholic church in droves for evangelical congregations and even mosques started by Muslim missionaries. Two decades after the emergence of the Zapatista National Liberation Army (EZLN), he will find that the state and its indigenous population remain firmly on the periphery of Mexican society. Federal government figures show poverty, inequality and hunger rates have remained stubbornly high – despite billions of pesos spent on roads, schools, clinics and a spate of social programmes. Critics in Chiapas contend that the wave of spending has been as much about controlling rebellious communities as raising the population from poverty. Pope Francis will arrive in southern Mexico as a somewhat unwelcome guest. Priests in the diocese of San Cristóbal de las Casas say the administration of President Enrique Peña Nieto wanted the pope go elsewhere, proposing the placid state of Campeche on the Yucatán peninsula as an alternative. The government feared that the papal visit could stir up latent indigenous discontent, the priests said. Sources in the federal government say its concerns over the papal visit to Chiapas were logistical, not political. Churchmen in Chiapas also see the visit as a vindication of the work of the state’s former bishop Samuel Ruiz, who led the diocese for 40 years until his retirement in 2000, but ran afoul of land-owning elites, politicians and the Vatican. Pope Francis plans to pray at the tomb of Ruiz, who shared a similar pastoral approach. He rode to remote Indian pueblos on mules, preaching in their local languages and organising them into Catholic communities – behaviour seen as a challenge to the rule of local landowners. He trained hundreds of catechist instructors and ordained married, indigenous deacons – a solution to perpetual shortages of priests – as he built a church which incorporated and appreciated indigenous cultures. The Vatican banned such ordinations in 2001, but Pope Francis has permitted the practice to resume. Some of Ruiz’s catechist instructors and deacons subsequently joined the Zapatistas, though the bishop opposed violence. He was appointed a mediator in the conflict and helped broker the San Andrés peace accords between the EZLN and Mexican government – an agreement the Zapatistas allege was never fully respected. The Zapatista struggle won worldwide attention, while its pipe-smoking spokesman, Subcomandante Marcos, became an icon of the anti-globalisation movement. Thousands of foreign “Zapaturistas” poured into the state, providing a presence some analysts suspect kept any army excesses in check. Today the Zapatistas have largely withdrawn to their autonomous communities though they can still mobilise their masses. An estimated 40,000 Zapatistas emerged unexpectedly for a march in five municipalities coinciding with the end of the Mayan calendar on 21 December 2012. Perhaps not coincidentally, a month later, Peña Nieto went to the Zapatista stronghold of Las Margaritas to launch his landmark social program, The Crusade Against Hunger. Brazil’s former president Luiz Inacio Lula da Silva was brought in to lend legitimacy to the launch. In a New Year’s 2016 message, EZLN spokesman Subcomandante Moisés said Zapatistas settlements were “better than 22 years ago”, but also better than those in non-autonomous communities, which have been supported by government programmes. But some observers say government money has already caused the movement to splinter. The social investments have produced some successes. “Thanks to this programme, we were able to study,” said Margarita Martínez, a Tzotzil linguistics professor. And while grinding poverty persists, change of a different kind is slowly happening in Chiapas. Martínez, 35, recalls coming to San Cristóbal de las Casas as a girl and not being allowed to walk on the sidewalk. Those prejudices persist – when she arrived at her university wearing traditional costume of a woollen skirt and colourfully embroidered shirt, security guards presumed she was a cleaner – but nowadays, more indigenous people have trained as professionals or occupy prominent places in commerce. Parents are still teaching native Mayan languages such as Tzotzil and Tzeltal to their children, but young people are also using it to produce poetry, rock music and even hip-hop. Parents dress their children traditionally for Catholic events such as baptisms and first communions, too. Indigenous art is also flourishing. Painter Saúl Kak opened an exhibit in the Casa de la Cultura in the state capital, Tuxtla Gutiérrez, showing the struggles of the displaced Zoque people. His paintings touch on political topics and including a piece with the familiar Coca-Cola font spelling the words, “toma con conciencia”, (a word play on the familiar slogan, reading, “consume with consciousness”,) to protest mindless consumerism. Back in Acteal, members of Las Abejas say they see some small signs of hope in their struggle, too. Compañeros and compañeras, receive a combative greeting from all the humble children, women and men of the ejido San Sebastián Bachajón; we hereby express our full support in solidarity with the compañeros members of Las Abejas of Acteal so as to support and raise our voice, we say to them that we will not take even one step back, our organization will continue in front struggling and supporting the compañeros in the situation of risk they are going through due to actions of the bad government; our word is stronger than a wall and we will join forces in order to defend life, the people and Mother Earth, we know that we are not alone in this struggle, because there are other people who are embracing and struggling to transform this world into something better and together united we will build a path of peace, freedom and justice. Have faith, compañeros and compañeras. We want you to listen to our words that your struggle is our struggle, that our organization is to support one another, this is why we express our contempt and anger at the narco government for contracting paramilitaries to assassinate and disappear people; we hold the government responsible for the threats and attacks against our compañeros members of the organization Las Abejas of Acteal, made in the ambush, armed aggression and physical injuries against three members, when on December 29, 2015 at approximately 7pm a group of three hooded individuals two of them dressed in black and one in a military-style shirt, shot at our compañeros with firearms in a vehicle near the Tsibal’um bridge about a kilometre and a half from the municipal headquarters of Pantelhó; this happened when they were returning from collecting sacks of coffee in the San Joaquin community in the same municipality; this ambush took place in the same region where six months ago Manuel López Pérez, a member of Las Abejas of Acteal, was ambushed and killed by three shots from a firearm. We also demand the immediate release of our imprisoned compañeros Esteban Gómez Jiménez, prisoner in Cintalapa de Figueroa, Chiapas (amate #14), Santiago Moreno Pérez and Emilio Jiménez Gómez, prisoners in Playas de Catazajá, Chiapas (cereso #17) who were imprisoned for having the commitment to fight and defend the mother earth, just as we also demand the freedom of other political prisoners of Mexico and the world. From the northern zone of the state of Chiapas the women and men of San Sebastián send militant greetings to all the compañeros and compañeras, communities and peoples of Mexico and the world who are in resistance. Immediate presentation of the disappeared and assassinated compañeros from the Normal School Raúl Isidro Burgos in Ayotzinapa! Long live the dignified struggle of our compañeros and compañeras from San Francisco Xochicuautla! On 2 December, the Las Abejas Civil Society of Acteal denounced that three families from its organization had been harassed in the Chenalhó municipality by the agent Antonio Vázquez Gutiérrez and the popular assembly of Los Chorros. As residents of the Jordan River neighborhood of the Miguel Utrilla district of Los Chorros, the families were obliged to accept a governmental project “service” involving sanitation drainage. Furthermore, two men of these families were punished with a fine of 5,000 pesos for having refused communal responsibilities. As members of the Las Abejas Civil Society, an autonomous organization, they do not receive any support from the government and do not pay taxes. In place of this, they demanded that their posture be respected, but the threats on the part of leaders of the assembly and the municipal agent have continued. 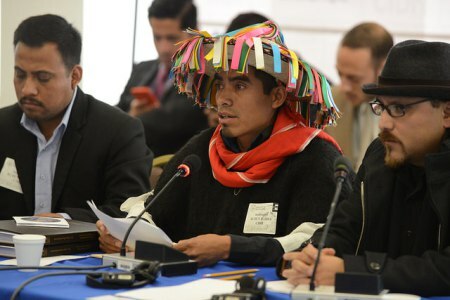 On 20th October, two days before their monthly commemoration of the Acteal massacre, the Las Abejas Civil Society, together with the Fray Bartolomé de Las Casas Centre for Human Rights (CDHFBC), participated in a public audience before the Inter-American Commission on Human Rights (IACHR) in Washington, DC, regarding impunity in the case of the Acteal massacre. In this audience, allegations were presented regarding the basis of the case that evidences “the responsibility of the Mexican State in the Acteal massacre and the lack of investigation, sanction, and compensation for the victims.” Las Abejas assured in the voice of Juan Vásquez Luna, Secretary of the Directive Table, that for the Tsotsiles of the Chiapas Highlands, “this massacre was planned by the Mexican State.” Before the IACHR, Las Abejas requested “that a profound report be prepared to investigate the Acteal massacre, declaring the Mexican State responsible for this crime.” For his part, the official representative of the Mexican government rejected all responsibility for the atrocity, using the argument that there is no report or recommendation that claims the State to have been responsible. “Throughout these 6.512 days we have been worn down with exhaustion,” say the victims of the Acteal Massacre to the IACHR. “This massacre was planned by the Mexican State itself. We will not accept an amicable solution; we ask for the case to continue in process until the truth is found.” Acteal. “We recognize that the state was unable to prevent these events or to respond appropriately after them.” Campa Cifrián. Chiapas, Mexico. October 20th. “We were given a blow, but today we are here to seek justice,” explained Juan Vásquez Luna, a member of the Civil Society Las Abejas of Acteal, at a hearing before the Inter-American Commission on Human Rights (IACHR) in Washington DC, to demand justice for the massacre perpetrated against 18 adult women, 4 of them pregnant; 16 adolescents; 4 children and 7 men, on December 22, 1997, 6,512 days ago, in the community of Acteal, municipality of Chenalhó, Chiapas. Vásquez Luna, a member of the board of Las Abejas, who lost nine of his relatives in the massacre, submitted to the Commission a study on the Massacre of Acteal, entitled: Psychosocial Study of the background, factors associated with the act and management of the emergency, psychosocial consequences and collective impact on the community of Acteal. “This psychosocial study will include a Forensic Expert Report,” he added. 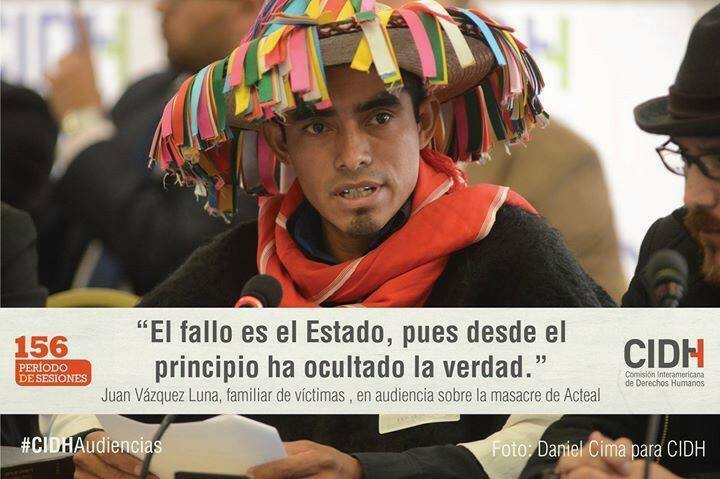 “This massacre was planned by the Mexican State itself”, assured the indigenous of the Chiapas highlands through the voice of Vásquez Luna, for which reason they called on the Commission “to issue an in-depth report on the case of the Acteal Massacre, declaring the State responsible for the violations.” Las Abejas of Acteal were accompanied by the Fray Bartolomé de las Casas Human Rights Centre (Frayba), as they have been since December 1997. “The Mexican government continues to promote impunity through their corrupt system” stated the Las Abejas Civil Society, noting that “Far from punishing those responsible for the massacre, they have rewarded them with lands, houses and even monthly pensions”. “Those directly responsible for the Acteal Massacre have been released,” they said. Meanwhile, Commissioner Ortiz questioned the representatives of the Mexican government “on what the Attorney General of the Republic (PGR) based the conclusion that the Acteal Massacre was not perpetrated by paramilitaries?” “If the state said that they did not preserve the scene of the Acteal Massacre, then what reliable conclusions could be drawn?” asked the human rights defender. 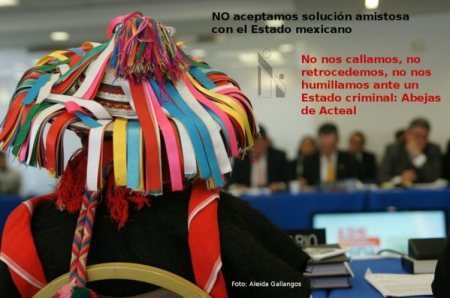 In his address to the hearing at the Commission, the envoy of the government of Mexico, Roberto Campa Cifrián, acknowledged that before the massacre in the community of Acteal, the State “was unable to prevent these events and respond appropriately after them.” And yet in spite of all this, “the Mexican State denies the internal armed conflict and low-intensity war that prevails in Chiapas,” said Frayba. “Impunity is part of the counterinsurgency strategy, because it exhausts and divides the survivors, which has brought us great pain. The integral policy of attrition from the Mexican State is their weapon to kill our memory, thus leaving the crime unpunished,” the indigenous in resistance also expressed in a communiqué on October 2nd. 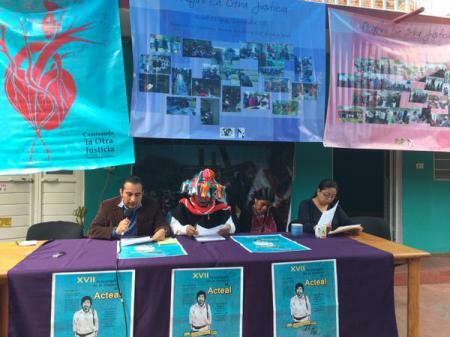 Following the hearing at the IACHR in Washington, the civil organization Las Abejas of Acteal held a press conference in San Cristobal de las Casas, Chiapas. “The Impact of the Acteal Massacre is manifested in chronic stress, lack of justice and community exhaustion,” shared the Indians in Frayba’s facilities. “It was mostly women who died at Acteal,” stressed Maria Vasquez, a survivor of the massacre. 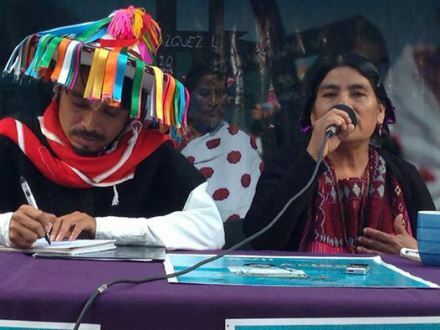 “The Mexican government wanted to exterminate us, but here we continue to denounce this state crime”, emphasized the Tzotzil indigenous woman. “Two years and nine months after the submission of comments on the case of the Acteal Massacre (30th January 2013), the petitioners have not received the alleged remarks of the Mexican state,” explained Frayba. “As discussed earlier in this audience we have asked the Commissioners of the IACHR to urge the Mexican state to submit its observations and for the Commission to issue the in-depth report in to this case,” said the human rights body. “The counterinsurgency stage, during the government of Ernesto Zedillo, was to undermine support from the civilian population for the guerrilla, in the highlands and northern areas, by means of police and paramilitary actions, under the command of the Mexican army and its Rainbow Task Force commanded by General Mario Renán Castillo,” recalled Frayba. “This strategy was unveiled by the document ‘Chiapas 94 Campaign Plan’,” they explained.